The U15B NJ Stallions 02 JUVE EDP team in their repeat trip to the USL Super Y National Championships made it to the Championship game this year and finished in 2nd Place losing to the now National Champions, U15B Miramar FC. The NJ Stallions boys staged an impressive National Championship run, scoring 7 goals, allowing only 3 over 5 games, which included the Final match in their loss to Miramar FC. The final 0-3 scoreline against Miramar FC did not really tell the story as the game was extremely well played with the NJ Stallions boys coming up unlucky on several scoring chances. Boys Director of Coaching, Marcelo Fracchia, had this to say, "It's always hard to lose in a final. We took advantage in all the previous games and our players worked hard to set themselves up to earn their opportunity to be in the Championship game. But unfortunately, it did not go our way. We will build on this experience as we go into our winter session to prepare for our Spring season." 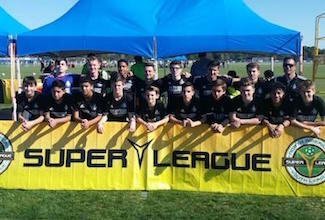 The U15B NJ Stallions 02 Juve team are now GotSoccer Ranked #3 in NJ, #13 Region I, and are in the Top 25 Nationally at #23.